GPS – Devices | Dispatching Solutions, Inc.
DSi Mobile integration is available through a variety of devices that cover a range of abilities, allowing you to select and implement the features that make the most sense for your company. Mobile Data Terminals have the widest range of features in the most streamlined package. Our flagship device combines GPS tracking with load management and two-way messaging for a one-piece solution, with plans for more mobile tools in the near future. 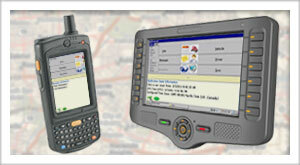 Black Box units are low-cost devices that have the same GPS tracking abilities. While these in-dash units are not able to display load information, they are an unobtrusive way to record the location and status of vehicles. Our forthcoming Android application can be used in conjunction with black box units to add load management and driver logging capabilities.